Tom Wolfe, my ally in absurdity. Wolfe, on the other hand, would be like a plate of something spicy and brash, something that hits you like a slap in the face and makes your eyes widen with surprise and delight. Spiced calamari, perhaps? I love Tom Wolfe and I chuckle my way through his novels and essays. So far I've read The Bonfire of the Vanities, The Painted Word, Hooking Up, The Electric Koolaid Acid Test, Radical Chic & Maumauing the Flak Catchers, and The Right Stuff, which I'm about halfway through on my Nook. My next conquest will be A Man in Full, which took him fourteen years to write and was his attempt to "cram the world into a novel." Wolfe is... a different breed, yet thoroughly American. His novels, set in the modern cityscape, are full of keen observation of the absurdities and hidden vanities of human nature, and rich in the kind of unforgettable description that makes you see the world in a different way. Best of all, they are based on real experience of the world as it is, the result of Wolfe's journalistic approach to novel writing. When writing A Man in Full, for example, Wolfe spent hundreds of hours in the newsroom setting, watching and observing the flow of conversation, the atmosphere, the way people interacted, the demands of the different jobs and how they interacted. When writing The Bonfire of the Vanities, he spent hours on Wall Street watching how the bonds salesmen worked and related to each other. He got the flavor of the place and the rhythm of the dialogues because he was there. He had enough interest in "the real" to immerse himself in it. Then the novel flowed from his real experience. He could create "imaginary gardens with real toads in them," as Marianne Moore would say, because he had studied real toads in their natural habitat. And toads they are. Many of Wolfe's main characters are very flawed men, which provides endless fodder for keen-witted comedy. This is what I particularly enjoy about Wolfe. It's not just that he is so good at getting us to laugh at other people; it's that, through his so delightfully flawed characters, he helps us to laugh at ourselves and to accept that this world is laced with more comedy that we would perhaps care to admit. Through the lines, Wolfe invites us not to get too pompous about ourselves, not to take ourselves "so goddam seriously, for chrissake." I love it. I love the crassness, the rudeness, the directness, the pages full of characters who curse and scrabble after their petty interests... the flashes of generosity and the immediate relapse into private cost-benefit calculations, and then the surprising moments of self-transcendence amidst the everyday reality of all-consuming vanity and self-seeking. Wolfe exaggerates, of course... but his exaggerations are just the magnification of something that is really there, like a skilled caricaturist who captures the subtle signs of an unconscious, habitual disdain in a subject's face and magnifies it into an all-out sneer. Just a few strokes of the pencil and the person's inner world is exposed, like Bill Clinton's bulbous nose as the emblem of a bumbling personality, or George Bush's close-set eyes as the dead giveaway of myopic determination. That's Wolfe. It's not that his characters are total caricatures, but that he has a knack for capturing and exaggerating certain traits to comedic effect. "The median strip on Park was a swath of yellow tulips. There were thousands of them, thanks to the dues apartment owners like Sherman paid to the Park Avenue Association and the thousands of dollars the association paid to a gardening service called Wiltshire County Gardens, run by three Koreans from Maspeth, Long Island. There was something heavenly about the yellow glow of all the tulips. That was appropriate. So long as Sherman held his daughter’s hand in his and walked her to her bus stop, he felt himself a part of God’s grace. A sublime state, it was, and it didn’t cost much. The bus stop was only across the street. There was scarcely a chance for his impatience over Campbell’s tiny step to spoil this refreshing nip of fatherhood he took each morning." The "nip of fatherhood" -- fabulous! The sublime and the stingy side by side -- love it! "Kovitsky stared at the window, still trying to make out his enemy through the heavy mesh. Then he took a deep breath, and there was this tremendous snuffling sound in his nose and a deep rumbling in his chest and throat. It seemed incredible that such a volcanic sound could come from out of such a small thin body. And then he spit. He propelled a prodigious gob of spit toward the window of the van. It hit the wire mesh and hung there, a huge runny yellow oyster, part of which began to sag like some hideous virulent strand of gum or taffy with a glob on the bottom of it. And there it remained, gleaming in the sun for those inside, whoever they might be, to contemplate at their leisure." The last phrase, "to contemplate at their leisure" is just as fabulous as the nip of fatherhood. 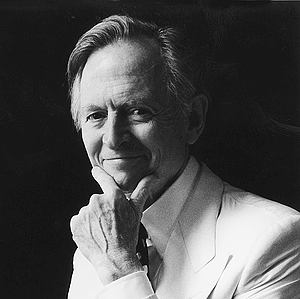 I know there are those who say that Tom Wolfe is more of an entertainer than a true writer. Wolfe has three critics (John Updike, Norman Mailer, and John Irving) who have denounced him as such. Wolfe calls them "my three stooges" and wrote a fascinating essay about how these writers in particular are perfect examples of why there have been no truly great American novelists in recent years. He calls them "effete" and notes that their books, full of sentimental characters with vague "inchoate longings" and "wistful glances," lack the force and power of true observation. The problem with The Three Stooges is that they write from their belly button, not from reality. They need to get out of their comfortable mansions and out on the street. They need to talk to someone else. They need to learn about how other people think, and stop creating characters that are just projections of what they think a properly literary character should be. Wolfe's rebuttal to his Three Stooges was quite a challenge. But it's refreshing and it applies in a broader spectrum of ways. What about "religious folk"? Don't we fall into the same trap as the "literary folk"? Religiosity divorced from reality... can it have any value? St. Teresa of Avila said that the saints are found "amid the pots and pans." I think that was her way of saying to the more mystically inclined sisters, "Get out of your room and get real." When I look back on my own "religious experience," I cringe a bit. God, I was so naive! So gullible in so many ways! And so quick to believe myths that fit the flawless image that I thought priests and religious people were supposed to have! Reality is so different from what I imagined then. I was living in some kind of a fantasy. I was so out of touch. I don't suppose I will ever be fully in tune with reality the way God sees it. But each day brings me a step away from naive idealism and a step closer to a faith built on reality. Through the process, I am learning that one can get upset and angry-- which is, I confess, a reaction I have been struggling with very much-- or one can develop a deeper sense of humor, maybe a gallows humor that is able to laugh at absurdities even when they hurt. It has only been through prayer that I'm finding my way to that second reaction, mainly because there have been a few times when I almost felt like God was laughing at me with conspiratorial sarcasm, in the way that only a dear friend can, in the way that makes you break down and laugh with him. I do think that God teaches us to laugh at the absurdity of our own expectations. It must be that humor and humility walk hand in hand. This is, I think, why Tom Wolfe is so dear to my heart right now. He paints terrible, tragic scenarios that overwhelm his characters, who lose everything (no happy ending in Bonfire, unlike the movie!)... and yet, he does it with such trenchant irony that you find yourself looking at the comedy hidden within a character's downfall. And then, when the main character does fall, he discovers himself more fully through the process; it is not a fall from grace, but a fall into grace and into the revelation of his true humanity. So Tom Wolfe gives us these imaginary gardens with real toads hopping through them, toads that teach us about our own warts and help us to have a good laugh. I don't care what the Three Stooges say. To me, that's good literature. Have you read Tom Wolfe's non-fiction "The Painted Word"? It really helped me to understand modern art. Yes! I found it so insightful!